The Canary Islands are situated in the Atlantic Ocean off the coast of Morocco. They were (re)discovered in 1402 by Jean de Béthencourt (1362-1425). He found the fair skinned Guanches living on some of the islands. He described them as cave-dwellers. After overthrowing the local chiefs, de Béthancourt became King of the Canaries under King Henry III of Castile. Pliny the Elder is frequently quoted to provide the etymology of the name, where he claims that it is derived from a species of large dog – canis in Latin – found there in ancient times. This derivation is disputed by the historian and arabist, Paul Lunde, who prefers the idea that the islands were named after an ancient people who lived on the opposite mainland and who now inhabit north-eastern Nigeria and are known today as the Kanuri. Pliny also records that the islands were uninhabited but had ancient ruined buildings when visited by the Carthaginians. Centuries later they were inhabited by a Berber people known as the Guanches who were finally conquered by the Spanish in the 15th century. When sea levels were lower during the last Ice Age, the land area of the islands would have been more extensive and possible claimant as the location of some or part of Plato’s empire of Atlantis. A popular belief is that the Canaries were the location of the Garden of Hesperides referred to in Greek mythology. However, this identification is difficult to substantiate firmly. Frank Joseph noted how the islands conform in many ways to Plato’s description of Atlantis. Natural hot and cold springs are to be found there, as are red, white and black rock, a combination also observed on the Azores. In the past the Canaries have been densely forested and also contain rivers and fertile plains that produce a variety of fruit. In 1939 the Ahnenerbe, led by theologian turned archaeologist Otto Huth, planned to visit the Canaries to study Guanche mummies as part of their efforts to find the Aryan homeland and locate Atlantis. However, the outbreak of war postponed their trip, but the Spanish dictator, General Franco, at the behest of his Nazi mentors appointed his archaeologist friend Julio Martinez Santa Olalla to carry out investigations on their behalf. A paper(c) by Professor Francisco Gracia Alonso and a recent book by author and journalist Jaime Rubio Rosales explore the whole subject of the Spanish links with the Ahnenerbe. In the 2nd century AD, the Greek astronomer and geographer Ptolemy suggested that the prime meridian should be located through the Canaries, then known as the Fortunate Islands. 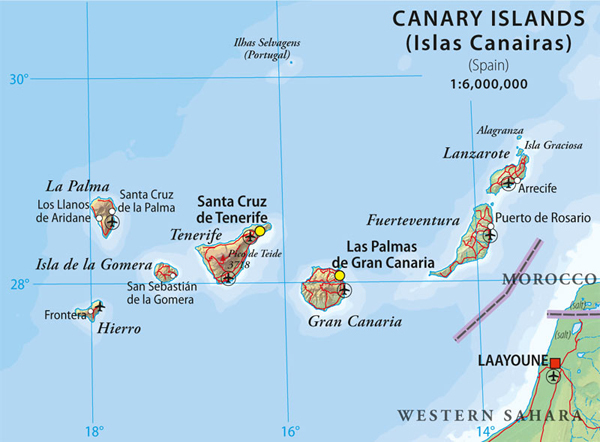 The earliest suggestion of a connection between the Canaries and Atlantis was proposed by Athanasius Kircher in 1664, referring to the Guanches as the last Atlanteans and the islands as the remains of Plato’s lost land. Ignatius Donnelly, who did so much to kick-start modern interest in Atlantis, considered that the Canaries, Madeira, the Azores and Cape Verde Islands were its remnants. However, a newspaper report from 1899(g) refers back to a local cleric and historian, José Viera y Claviejo, who proposed around the beginning of 19th century that the Canaries, the Azores and Madeira were remnants of Atlantis, nearly a century before Donnelly. Gilbert De Jong is a Dutch landscape designer with an interest in investigating the mysteries of our ancient past. His contention is that Atlantis was located at El Fuerte – in the Canary Islands. In 1984 Manuel Gómez Márquez also ‘revealed’ the Canaries as the location of Atlantis in a book using the Piri Reis Map as a source. One of the more recent proponents of a Canarian location for Atlantis is Charles D. Pfund in his extensive 2011 book Antediluvian World: The End of the Myth. A website dealing with a variety of British and World mysteries(d) has a series of papers on Atlantis and reluctantly considers the Canaries as the most likely location of Plato’s lost land. Thor Heyerdahl inspected the pyramids at Guimar and was convinced of their ceremonial use in ancient times(b).The late Philip Coppens also wrote an article(e) on these structures. A 2015 article(f) can now be added to this list.